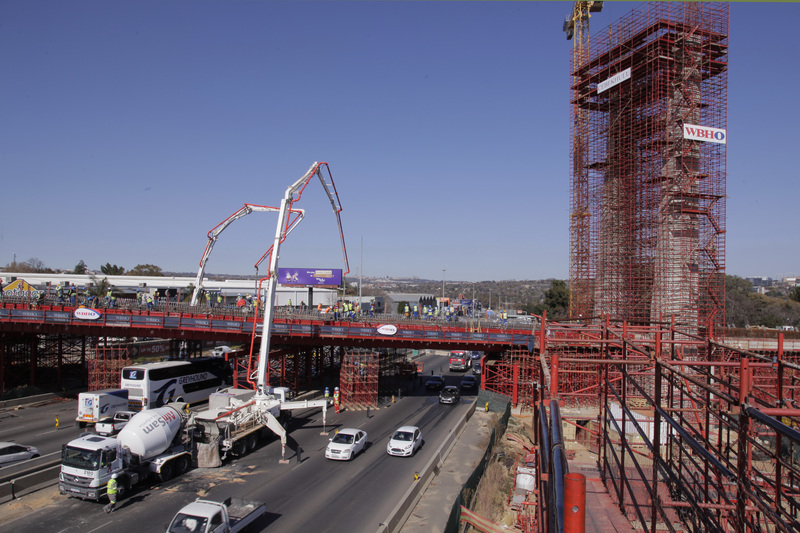 Leading concrete solutions company AfriSam has been an integral part of the exciting and highly visible cable-stayed bridge crossing one of South Africa’s busiest highways, the M1, between the Sandton and Marlboro Drive off-ramps. The 258 metre bridge is part of the Reya Vaya Bus Rapid Transport (BRT) system linking Sandton, Alexandra and the Johannesburg central business district (CBD), which sees the City of Johannesburg rolling out ‘eco-mobile’ infrastructure to improve mobility for commuters. The location of the bridge creates a link between Katherine Avenue in Sandton and Old Pretoria Road in Wynberg, which takes traffic towards the Johannesburg CBD. Concrete was an important element of the bridge design, and was chosen to minimise the impact on the M1 freeway traffic during and after construction, as well as to maintain acceptable gradients within the limits imposed by the spans and the available space for the approaches. The project comprises three separate bridges; the cable-stayed main section over the M1 highway and two approach spans – one over Bowling Avenue and Katherine Street on the Sandton side, and the other to Lees Street in Wynberg. While the main bridge is an in-situ concrete construction, the two approach spans on either side are post-tensioned voided decks. There are also two pedestrian access ramps which are key elements in the City of Johannesburg’s access mobility initiatives to ease and improve access for pedestrians. This will allow easier access for over 10 000 pedestrians and cyclists who cover the five km journey from northern Alexandra to Kramerville and Sandton every day. “The BRT Bridge pedestrian walkways coupled with The Great Walk provided for on the adjacent Grayston Bridge will help provide a safer commute to work for the majority of the residents in Alexandra who can’t afford to use public transport to gain access to Wynberg, Kramerville, Marlboro and Sandton and thereby improve mobility and liveability,” says JDA spokesperson, Susan Monyai. Cliff Weideman, consulting engineer at Hatch – the company that designed the bridge – says the design had to accommodate the high traffic flow by ensuring the least possible impact from the construction work. The 8% gradient on Katherine Avenue, as well as the relatively short approach to Old Pretoria Road on Lees Street, meant there were challenges in maintaining the necessary clearances while keeping to reasonable gradients for the busses. In addition, the bridge pylon had to be positioned outside of the M1 road reserve, and this resulted in an asymmetric geometry in main bridge with a back span of 38,6 metres and a main span of 83,3 metres. Supporting the bridge are two 52 metre high, reinforced concrete pylons on each side of the deck with 10 pairs of cables in support. Each pylon is a double-braced column measuring two metres by six metres at the base and two metres by 1,5 metres at its top. The substructures – with the exception of one of the piers – are on piled foundations; these are mainly augur-bored piles and pre-augured driven displacement piles. The auger-bored, piled foundations extend into and are socketed in the underlying rock. The design is based on the use of the Freysinnet H2000 multi-strand cable-stay system for both ends, which use the fork-to-fork connection that can be re-stressed at the top end of the pylon. The piers – which were all cast in-situ with concrete – have a curved profile to improve the aesthetics of the bridge. The abutments are integral with the reinforced earth ramp approaches, with an abutment ‘seat’ supported on reinforced concrete columns within the reinforced earth. The asymmetrical nature of the structure made it necessary to introduce tensioned holding-down anchors at two of the back-span piers, through sinking the respective piles for these piers 10 metres into the underlying rock; this balanced the bridge and countered the tension forces developed when the structure is loaded. The holding-down anchors also extend into and are tied to the deck. The tie-down anchorage arrangement also required the stiffening of the back-span deck, by introducing a longitudinal beam. This was achieved by widening and increasing the cross-section of the edge at the New Jersey barrier – resulting in a substantially thicker barrier than the conventional standard design. The concrete used in the decks, piers and foundations was specified as durability concrete, with requirements to achieve a set oxygen permeability index, water sorptivity and chloride conductivity. Self-levelling concrete was used in areas where there was a high concentration of reinforcement. In the bridge’s construction, temporary formwork supports were employed, using super-beams over the freeway lanes as well as a support in the median; due to their proximity to traffic, the temporary supports were given substantial collision protection. An existing reinforced concrete pedestrian bridge was demolished during the construction phase, and a temporary pedestrian bridge was assembled and erected, all in the space of a single weekend. Doing this required one carriageway at a time to be closed; traffic was managed by contra-flow while the temporary bridge was put up over the closed carriageway. This helped to minimise the impact on the M1 traffic; the temporary bridge will remain open until the main bridge is completed. The structure will be provided with normal street lighting for vehicles and pedestrians, as well as feature lighting to draw out the characteristics of the bridge. In particular the lighting will emphasise the pylons, cross beams and handrails.